Like almost no other person in the world, at 15 I decided I wanted to be a rock and roll guitar player. It was going to eb tought. Not only did I lack a guitar, I would not know what to do with one. I asked my parents if I could take lessons, and like most everything I asked for they supported it. I signed up for lessons, every Saturday while Mom did her grocery store, I stood slightly embarrassed with a red, white and blue cheap guitar in the strip mall music store (it looked somewhat like this one). I cannot recall my teacher, he probably was a tired hippy, but had those long natural guitar fingers and made it look so easy. He must have sensed my goal (like it was hard to guess), so while he did get me learning some scales and basic theory, he pulled some music boks in with music of the era (or the one before), America and Jackson Browne were the first ones I recall. But one thing he taught me in the first month was the opening to Day Tripper by the Beatles, that opening naked riff was actually playable. So to do this assignment, I had to play it on another instrument. 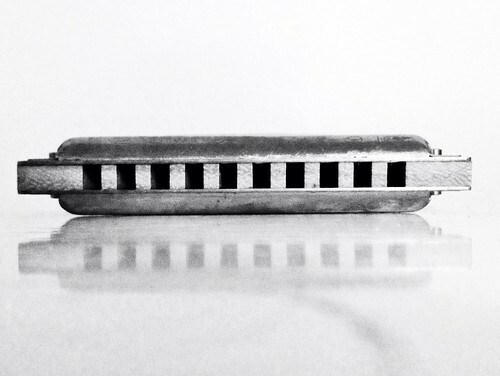 I do not even know the notes at all on the blues harp, so its just wild off the mark guessing. I honked through ne verse, then picked up my guitar and gave it a run through (wow I am rusty on that too). And the extra bit of the story was that my parents told me if I stuck with lessons for 6 months, they would get me a “real” guitar to replace the red white and blue loaner from the store. That as a sufficient incentive. They got me a Takamine F-340 which, if you stand far away from it, is supposed to be a visual ringer for a Martin, especially for the logo text on the headstock. Supposedly Martin wrote them a letter of intent to sue, but never followed through, and Takamine later changed their design. This is the guitar I still own, some 30 years later, and not a whole lot better, but this thing has been everywhere with me. 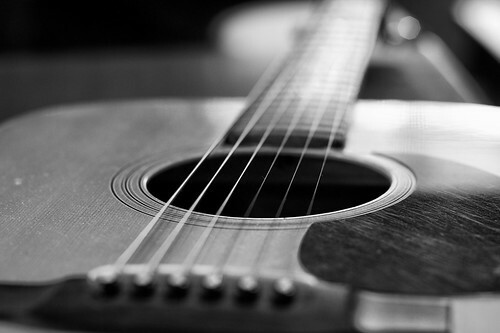 It’s got my sweat in it, the molecules of scraped skin, a ding where some drunk guy at a campground banged it on a rock, one of the tuning heads has been loose for 2o years… yeah, its got wear and tear, like you and me. It’s a part of me. And I of it. I gotta good reason for taking the easy easy out. OH DUDE that is some excellent guitar playing you’ve got going on. : D I bet you’ll be just as skilled at the harmonica in no time. Actually this kinda makes me want to break out my recorder… BANE OF GRADE SCHOOL MUSIC TEACHERS EVERYWHERE.